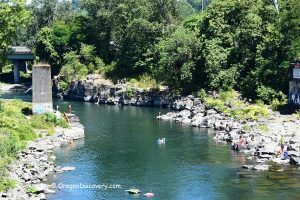 Located right between Interstate 205 and the Willamette River, High Rocks on the Clackamas River is not only one of the most popular and heavily visited swimming holes in Portland but also one of the most notorious. Regardless, it is definitely the most visited destination in the quaint and sleepy town of Gladstone. 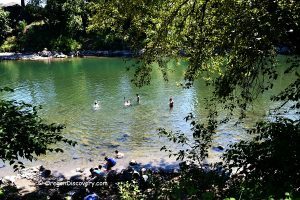 As the Clackamas begins to converge with the Willamette River, the widening river gets slower and deeper creating a natural swimming pool. The banks of the river are composed of high cliffs which provide for ample jumping opportunities; ideal for adrenaline junkies. While the dynamic rocky terrain is ideal for climbing, jumping or sunbathing, it brings with its own hazards. The frigid water temperatures alongside the strong currents, hidden underwater ledges, and an undercut bank are a deadly combination. The water simply appears calm on the surface; the tranquil exterior hides incredible turbulence. Notwithstanding the danger, High Rocks on the Clackamas River are a perfect getaway to escape the mid-summer heat. Crowds throng the destination even though the proximity to the freeway is a deterrent. This is because High Rocks boasts of an incredibly unique rocky bank and a breathtakingly picturesque stretch of water. Furthermore, the rocky and steep outcropping alongside the river provide a perfectly rugged surface for those wishing to indulge in fishing, picnicking or quite simply lazing in the sun. If the ruggedness of the terrain concerns you, it is essential to know that there are now lifeguards employed to prevent accidents from happening, allowing you and your loved ones to enjoy the true beauty of the High Rocks. 45 miles northeast of Salem. Take exit 11 from I-205 toward Gladstone/DMV. Turn left onto 82nd Drive.